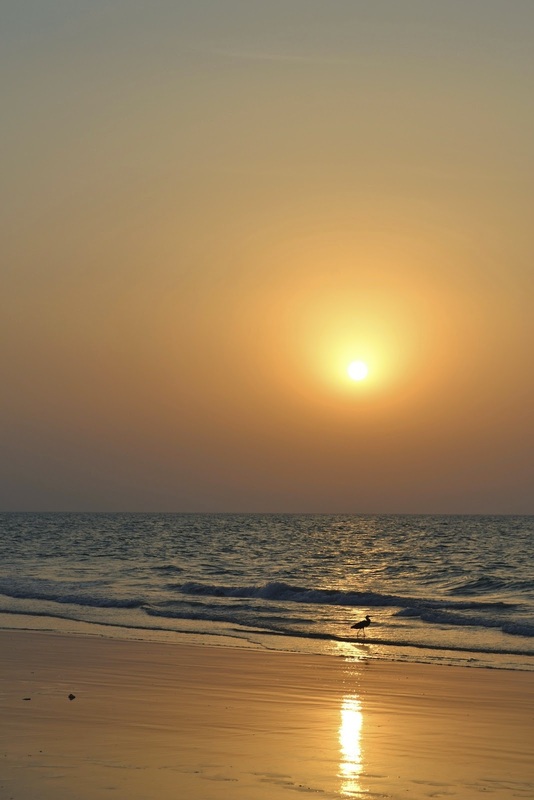 The daily meal structure revolves around two main meals: breaking the fast (Iftar) as soon as the sun goes down, and the last meal of the night (Suhoor) sometime before the sun comes up. During Ramadan last year, my friend and colleague Mohamed invited me for Iftar. I took an expat friend and we drove to his house where we met two of his brothers. We entered the building through the “men’s” entrance and were ushered into the Majlis, a large lounge with sofas around the walls and an elaborate rug on the floor. Emirati families sit on the floor to eat their meals – a tablecloth was set in the middle of the rug and the guys brought various insulated pots containing the meal and plates for us. Then it was time to eat. Here was my first problem – I don’t normally sit on the floor to do anything, I had trouble enough sitting down let alone eating once I got there. Mohamed had anticipated this and gave me a large cushion. But, my second problem was actually picking up the food and eating it – I needed one hand to lean on. The others sat and had both hands free. And, Emiratis don’t normally use utensils, picking meat and rice up with their right hand, I must say skilfully. Again, Mohamed had thought of me and provided me with a knife and fork – but with only one hand free I chose to struggle through consuming the rice with my hand. But the food was really good and showed the mix between Lebanese and Indian that typifies Emirati food. We started with Lokma – sweet pastry balls served with date oil. Then chicken soup; everyone drank from the small bowls but I had to use a spoon – and apologize for being left-handed! Next we had crispy, spicy Samosas and Pakoras, dipped in fresh yoghurt, followed by Harees – a savoury porridge where meat and vegetables are added to coarsely ground wheat and cooked for several hours. It was very tasty and easy to eat with your fingers, although I got through a lot of napkins! The main course was leg of lamb with rice and lentils – the lamb just fell off the bone, it was delicious. For dessert, we sat up on the sofas and ate crème caramel or jelly, again foods exclusive to Ramadan. And, it didn’t take me as long to get up, as I’d thought. We drank black sweet tea and finally Arabic coffee. My first taste of Iftar was a memorable evening - Mohamed and his brothers had served us well. Petra is spectacular but it is dusty and hot; plus you walk miles when you visit – it’s a mile or more of walking just to get into the site, and your return is all up hill. I must have walked in and out of that site six times in the three days we were there. I walked in and was ushered into a changing room. A woman in a hijab sat outside. It turns out I should have worn swim pants. “Strip down to what you are comfortable with,” the man said - I had to go beyond that. I walked out holding my clothes strategically, wearing only my underwear and walked past the woman to my locker. I entered the hot tub as quickly as I could - a young woman in a bathing suit was already there. As we both drank our fruit tea, I asked her where she was from. “Toronto,” she said – a surprise to neither of us! Shortly, the woman in the hijab appeared and called the woman into a side room. At last, I sat alone in my boxers. “Mr Robert,” a voice called and my masseur Ali arrived. He led me to a room that, frankly, looked like a 19th century morgue; filled with tomb-like marble ‘beds’. I climbed on one as I was told and led face down. Ali quickly hosed me all over with hot water at some pressure, then rubbed and washed me all over with a large bar of soap. Following this, he scrubbed me with a coarse block. This was not entirely pleasurable – I am, to say the least, ticklish. But then he climbed up on top of the block and began pummelling and kneading me; pushing his fists and elbows into various knots and lumps. He climbed down, asked me to turn on my back and started all over again. I was helpless as he pulled on my arms and legs, yet as he threw me around I could feel the aches slipping away. Finally it was over. “You can go and shower off in the corner,” he said, as he left me. But, this was easier said than done. Climbing down from a marble slab that, like me, is covered with soapy water is no mean feat. I slipped and slithered and somehow got back to the changing room without losing my soaking wet shorts. Toyota pick-up trucks, the workhorse of the Middle East are painted white in UAE; here they’re multi-coloured, and driven with much more care… And, in Jordan, no one pushes you aside in a brand new SUV. We entered through the ‘car repair district’; stores filled with mag wheels, foil-wrapped tires and sheepskin seat covers. Every other store is a garage with men’s rear ends displayed from under the hoods of autos being tuned. Not a square metre is wasted here - we saw our first rooftop scrap yard. In fairness, we filled some senses too; in our large van, driven by our friend with her long auburn hair on display, and Carol with her blond locks too – we caused a stir – one guy ran from his store, hands on his heart, blowing kisses to Carol as we passed. She waved back coyly. Despite the intense traffic, everything went well until we parked. I guided the van into a tight spot on the street but, too close to the kerb; a tire popped and released some air - not quite flat but close. As we took in the sights we kept one eye open for a garage – eventually we spotted one; the van limped there cautiously for a puff. Whew; now all I had to do was convince the guy to accept payment – he didn’t know how much hassle he’d saved us. Amman is new having been built largely within the last 150 years, although it does have some impressive Roman remains; an amphitheatre and the Citadel that dominates the city from its perch atop Jabal al-Qala’a, built when the metropolis was known as Philadelphia. Sadly, we only had time to see the theatre before heading to the airport. Jordan is an oasis in a region of turmoil but there are the inevitable signs of security; barriers protect the British Council in Jordan along the iconic Rainbow Street. But, as with everywhere in Jordan, the people are warm and friendly; and just down from that wall, a quirky leather camel marks a parking spot in front of a cafe. Our time in Amman was short but definitely flavourful. 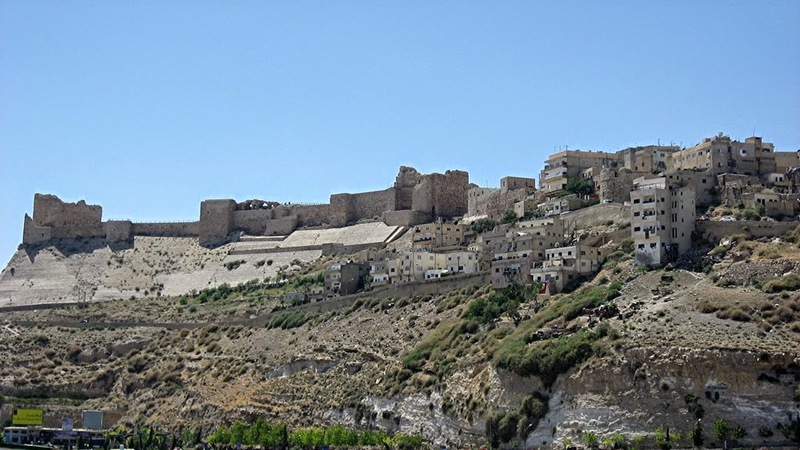 Karak Castle dominates the surrounding countryside, from its perch high in south central Jordan. On a clear day you can see the Dead Sea from here. The Christians built it in the 12-century at the height of the Crusades in their attempt to control this part of the world and managed to hold it for almost 50 years. Its most notorious ruler in those years was Raynald de Chatillon, noted for his cruelty – he was fond of throwing people to certain death from the castle walls. Often he would encase the victim’s head in a box in order, he thought, to prolong their consciousness. He signed a truce with the Muslims led by the great Sultan Saladin but almost immediately violated it, plundering their caravans. Saladin, celebrated for his noble and chivalrous behaviour, was so enraged that when he ultimately captured Raynald, Saladin personally beheaded him. Karak is the largest Crusader Castle remaining in the Middle East and it’s impressive; the city clings to the north end of the castle, its only entrance. The roads around this gate are sparse and parking even more so. We climbed to winding roads in our rented van and looked for a spot. As I approached the main entrance a large man in a billowing shirt called to me. “If you’ll have lunch in my café, you can park here,” he said, pointing to a space in the street. I’d started to parallel park when a policeman appeared. “No!” he shouted, “Police parking.” And as he said this, a police van drew up. “Ignore him!” white shirt man said, “this is my space.” The two started to argue furiously. Eventually, a second cop arrived and was even more strident with me. I explained that although I liked his shirt, I felt I should obey the guy in uniform. White shirt man strode off and moved a car in front of his restaurant and put me in there. He was furious though, explaining that the restaurant owners around the castle had paid to have that parking before the police had appropriated it. The castle is a large site, well preserved and with many levels – we did our best to burrow through it, romping along dark passages, climbing the turrets and enjoying the expansive views. We never could find a washroom though… and frankly after the parking debacle, we were keen to get back to our friend’s cafe for lunch. As we sat on his patio eating our chicken kebabs, washed down with lemon-mint drink, I realized how little room we’d left the tour buses. I must say it challenged my appetite as I watched each bus squeeze by my driver’s door. Jerash is an hour north of the capital, Amman, just off the main north/south highway in Jordan – don’t let your GPS (SatNav) tell you any different. When we visited in October, my GPS had a short cut, it said; foolishly I followed it – through Amman’s ‘car-repair’ district, over a very steep goat track, up hill and down dale, dragging some friends behind me – we were in two vehicles. Note to self – always check the map first! …And, this was not a good place to get lost – we were only 30 kilometres (20 miles) from the Syrian border, yet there was no sign of the conflict. This is a huge site; in the three or so hours we had to explore it we could only scratch the surface and we welcomed the opportunity to sit and listen to the pipes before I climbed to the theatre nosebleeds – I was out of breathe when I got there but could see the whole site spread beneath. We made our way to the Temple of Artemis, the highest building in Roman Jerash, and from there east to the Cardo Maximus or main street and down into the Forum. The guidebooks tell you that chariot wheels caused the deep ruts in the Cardo – this had been a busy street. As we walked, I mused that these ruts reminded me of Calgary’s icy streets in winter, when there hadn’t been a Chinook (the warm Chinook wind melts the snows in winter and the city relies on it to clear the streets). A voice from behind said: ‘Did you say “Chinook”?’ It was a family from Calgary, of course, reminding us what a small world it is. Exhausted and a little sunburned, we retired to our hotel in Amman. Next day we drove south to Madaba, famous for its spectacular mosaics. 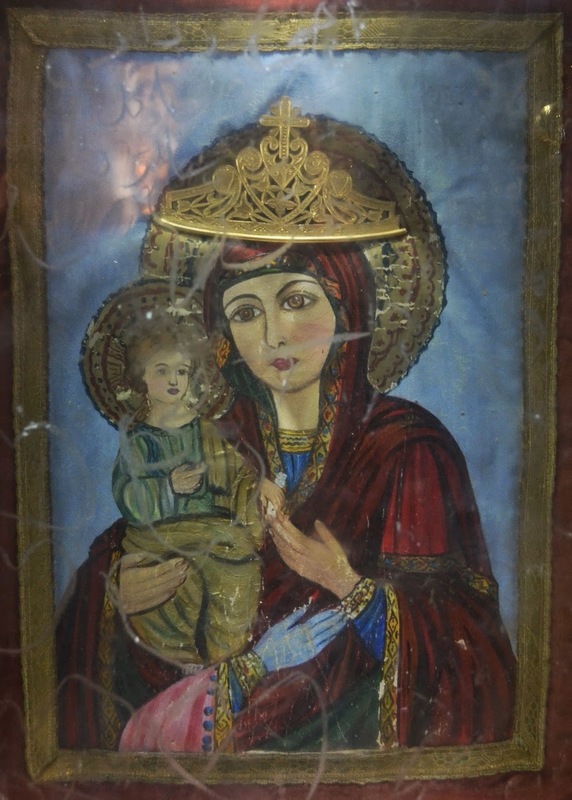 But, I was more interested in entering the basement of St George’s church, to see the painting of the Virgin with the Blue Hand. Legend has it that this ghoulish extra hand just appeared on the painting one day; it’s blue and appears to have fire coming from the thumb. St Georges was built to protect a 6th Century mosaic map of the Holy Land and it was packed with tourists. The ‘Blue Hand’ painting is a shrine and I thought I’d have to fight to see it, but there it was in a small empty room below the altar, locked behind graffiti-coated Perspex. But, I had to hand it to Jordan. For travellers in the Middle East, this is one country that has a wealth of antiquities within safe, easy access.